It’s beginning to feel a lot like winter and with cold temperatures comes dry, rough, calloused, sore feet. 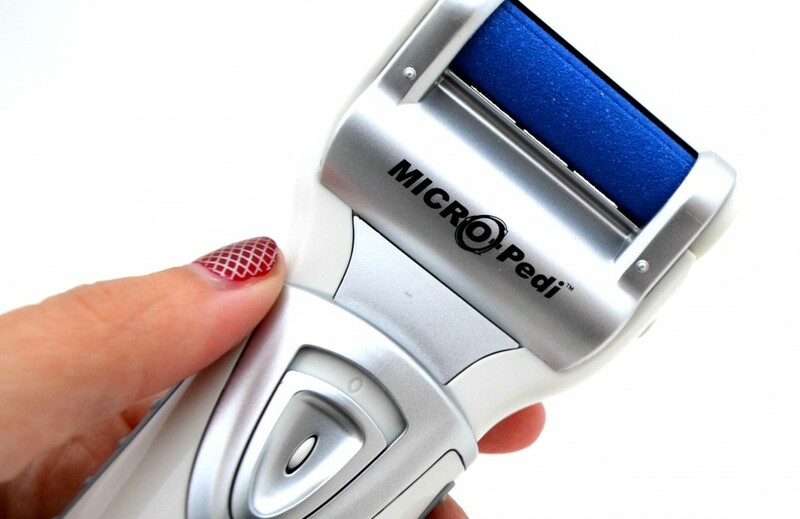 For those of us that don’t have the time, the patience or the money to head to the spa each week for a pedicure, Micro-Pedi Callus Remover will help get your feet looking like a baby’s bum in no time. Emjoi Micro-Pedi Callus Remover is a revolutionary device for at-home pedicures that takes the chore out of getting smoother, softer skin on your feet. It’s a battery operated foot buffer that’s safe to use at home and is a better alternative to those traditional, harsh, metal scrapers. 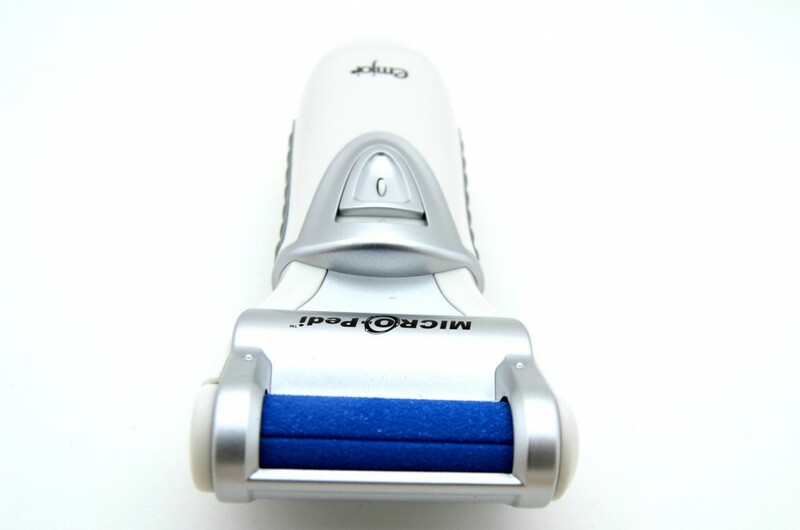 Micro-Pedi Callus Remover features an unique micro-mineral (that feels pretty much like sandpaper), spinning roller, that spins at 360 degrees, at an amazing 30 times a second to quickly and easily buff away rough, callused skin on feet to reveal supple, touchable feet in as little as a few minutes. It has a rubberized grip for easy use, is small enough to fit in the palm of your hand and is also shaped perfect to get up under your toes to remove any build up you may have. It’s quick, easy and painless and is safe to use on both hands and feet. 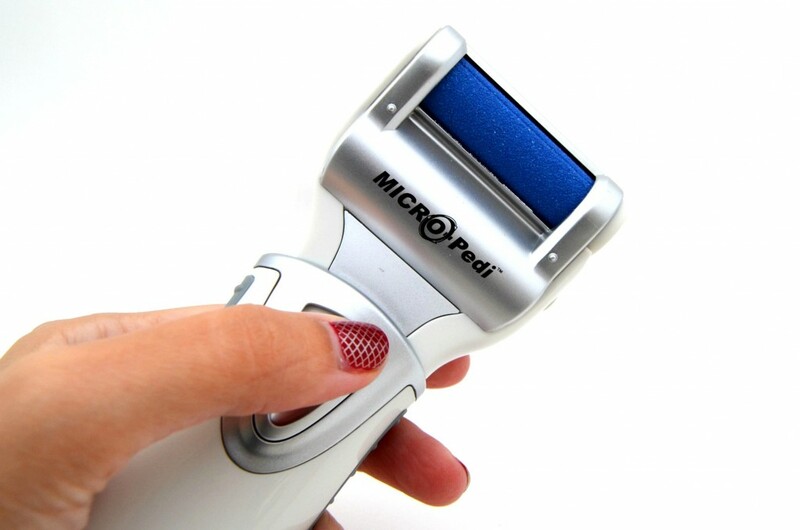 Micro-Pedi Callus Remover couldn’t be more easy to use, place your roller into the device, remove the protective cover and you’re all ready to go. Wash, clean and dry your feet first, turn on the unit and gently rotate back and forth or side to side over your harden skin for 2-3 seconds. Make sure not to press too hard or the unit will shut off, and never hold in one place for more than 3 seconds. Continue on the feet until you have the desired softness you were going for, turn off the machine, wipe excess dead skin off the feet and wash the unit. It also comes with a handy brush to clean inside the unit, when dried place the protective cover over the unit to keep it sterile until next use. Although you’re able to wash the unit, it’s not waterproof, so you never want to submerge the unit in water as it may damage it. 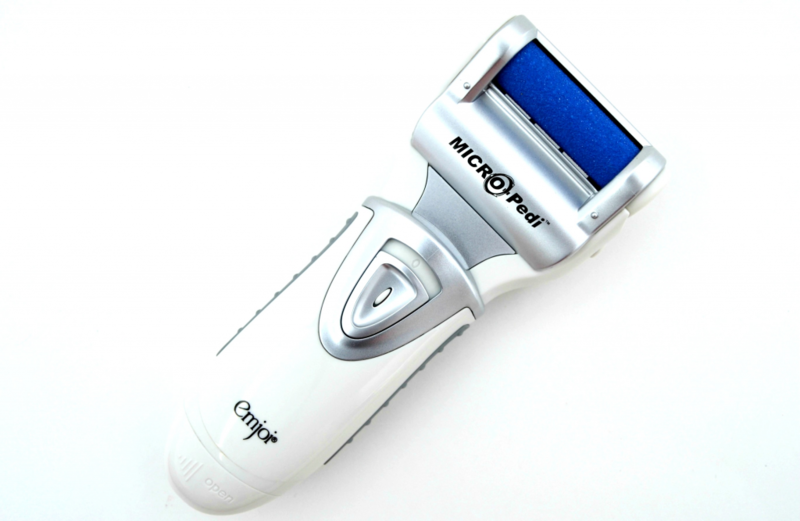 I love that the Micro-Pedi Callus Remover is battery operated which means no pesky cords to get in your way and I feel its way more safer, cause there’s no blades or sharp objects, and more sanitized than scrapers, as you’re able to wash this device in soapy water after each use. 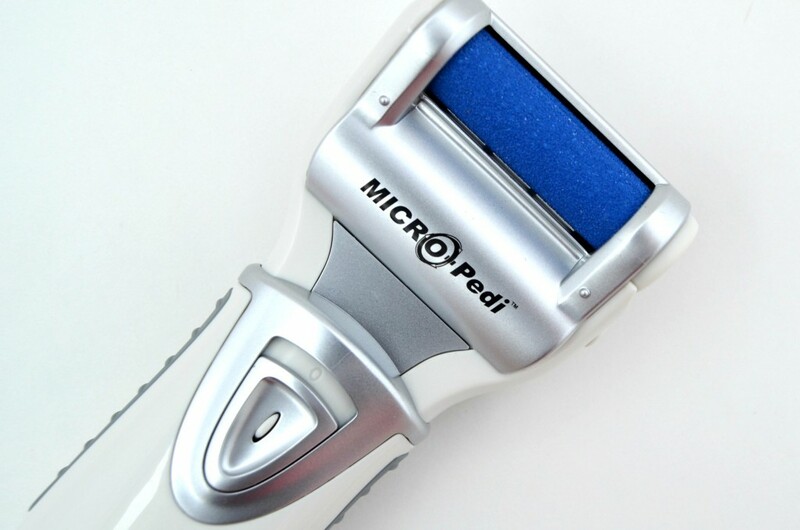 I was worried at first about over filing, but with the Micro-Pedi Callus Remover files down all of the hard skin your feet don’t need, it will stop buffing off the dry skin (you’ll be able to see no skin coming off) and you’ll know at that point your skin is in perfect shape and you can stop using it. I really couldn’t believe how smooth and less dry my feet were after only the first use. By the second time I used it, my rough, callused heels were almost perfect (I have my heels to thank for the calluses) and my feet were left feeling soft, supple and beautiful; the best I’ve seen in years. Although I’ve only used it twice, the overall appearance of my feet is almost unbelievable. 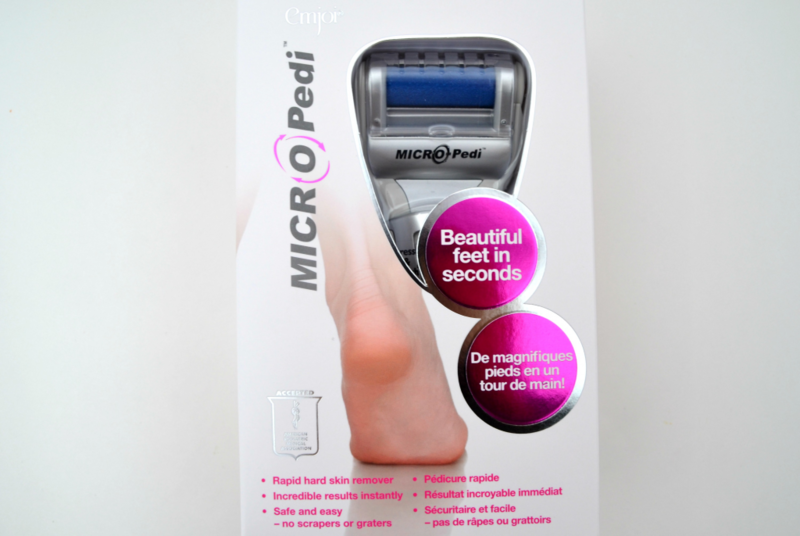 I will continue to use this about once or twice a month to maintain my gorgeous feet and heels, no more expensive pedicures for this girl, thank you Micro-Pedi Callus Remover. This retails for $49.99 and can be found online here or at your local Shoppers Drug Mart. Replacement rollers cost $19.99 for a 2 pack and you’ll get about 8-10 uses out of each roller.